A new breed of populist politician is emerging across Europe and Hungary’s Victor Orban is foremost among them. Once a liberal opponent of communism, he is now at the vanguard of an anti-immigrant nationalist movement that seems unlikely to disappear anytime soon. Our five day tour takes us south to the recently constructed fence with Serbia designed to keep out the waves of immigrants that once crossed Hungary’s borders. We meet the large numbers of supporters in the towns and countryside swept up by Orban’s brand of nationalism. His party, Fidesz is accused of riding roughshod over basic democratic rights – but appears unchallenged at the polls. Abroad Orban envisages a shake up of the EU with less power in Brussels. There is room too, he says, for an illiberal state on the continent. Brussels in turn has sought to sanction Hungary for its breach of its values. It is far from clear who will prevail. 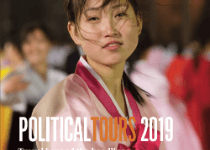 For an insight into some of the most critical issues dividing Europe at the moment, it is a tour not to be missed. 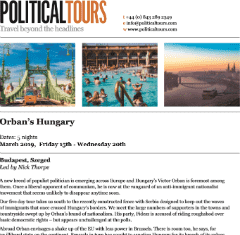 The tour expert is veteran BBC correspondent, Nick Thorpe, who has lived and worked in Hungary since the mid-1980s. Meet in Palazzo Zichy Hotel in Budapest. Introduction by Nick Thorpe, BBC Central Europe Correspondent who will be leading our tour. We then leave for dinner. Introduction to Orban and Fidesz, and its transformation. Depart for Szeged and the southern border and the location of the recently constructed fence. Our aim here is to look at the growth of support for Fidesz and how the immigration crisis of 2015 was key to that. Visit to Röszke – one of the main bottlenecks of the 2015 migrant crisis, still home to one of Hungary’s 2 Transit Zones, where small numbers of asylum-seekers are allowed into the country, then kept in detention while their applications are assessed. In neighbouring Asotthalom, a village of 3,000 inhabitants, we meet a leader who bitterly opposed migrants. He was the first to propose building a border fence. Immigration became an obvious touch-stone for ordinary Hungarians. Fidesz’s support goes wider than that. Orban Fidesz makes sure all EU subsidies are paid on time (he took part in tractor protests under the Socialist government over late and inefficient payments.) We meet the mayor of a village close to the point where the Hungarian, Serbian and Romanian borders meet. He has rebuilt his village economy, including a restaurant, cafe, and solar energy, despite opposing central government. Meeting with a senior member of Fidesz in the region and discussions over dinner. We spend 2 days in Szeged where we we stay at the Tiszavirag Hotel, the best hotel in the region. We meet a variety of speakers between Monday and Wednesday. We will be visiting the parliament as well as meeting with think tanks and diplomats. Meetings have been arranged with a series of senior politicians and analysts. Please contact us for further details..
All of your accommodation and meals with water are included, as well as local transport (except during your free time). Flights are not included in the price and need to be arranged by customers themselves or with an agent. We can advise you on reservations if you need any help. This tour starts in and ends in Budapest. We also travel to Szeged. As on all our expert-led tours the groups are deliberately small and will not exceed 12 people. Frequently we travel with 8 – 10 people. Limited spaces are available. UK passport holders do not need a visa. Hungary is a party to the Schengen Agreement. U.S. citizens may enter Hungary for up to 90 days for tourist or business purposes without a visa. Other passport holders may require a visa. It is always good to check with the embassy in your country for latest advice regarding visa requirements. The weather gets colder in October and temperatures drop from to an average of 12 degrees Celsius towards the end of the month. A warm jacket is essential. There are no specific dress requirements. However, we suggest taking layers as the weather is variable. Rain showers are not uncommon too so please ensure you pack a rain jacket. Comfortable shoes are essential especially for Szeged. Advice on health requirements may be obtained from your GP, or alternatively from the Department of Health leaflet Advice on Health for Travelers, or the Department of Health in the UK. For further information on vaccination requirements, health outbreaks and general disease protection and prevention you should visit http://www.fitfortravel.scot.nhs.uk/destinations.aspx. Plugs are 2 pin European and 220v. Wifi is available in all hotels, as well as many coffee shops and restaurants. Nick Thorpe is a writer and award-winning BBC journalist, specialising in eastern Europe, born in England in 1960. He studied Modern Languages at the Universities of Reading (UK), Dakar (Senegal) and Freiburg (Germany), graduating in 1982. He has lived in Budapest since 1986. He reported on the fall of Communism throughout eastern Europe and the break-up of Yugoslavia for the BBC, Observer, Guardian and Independent newspapers, including the wars in Croatia, Bosnia, Kosovo and Macedonia. He has been Central Europe Correspondent for the BBC since 1996. With BBC colleagues, he won a Peabody award for his coverage of the Refugee crisis in 2015. 1989 – The Unfinished Revolution – Power and Powerlessness in Eastern Europe (Reportage Press 2009, Endeavour Press 2015). Scolar Kiado Budapest, April 2018/ to be published by Yale University Press, April 2019. The Travels of a Gadjo in Romanistan, seven 52 minute documentaries on Roma communities in 9 European countries (Duna TV, 2015). Orban is riding high, politically unchallenged either by a viable opposition or from within Fidesz, and he’s looking forward to the May 2019 European elections with relish. He hopes to either reshape the EPP in his own image, or split the EPP to lead a new anti-immigrant block, which would claim to return to the Christian Democrat roots of parties like the CDU and especially the CSU. Bavaria (with a similar population to Hungary) has often been his lodestar. 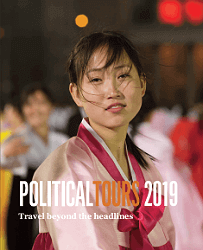 In his own rhetoric, he has now dropped his ‘illiberal’ terminology, and prefers to present himself as a Christian Democrat – a term he always shied away from until now. On a European level, post-Brexit, his strategy is to replace and improve on the position of successive former British governments: to push for a wider, shallower union. Shallower, because he is a champion of maximum national sovereignty; wider, because he wants the EU to expand into the Balkans. The Visegrad-4 platform is central to his endeavours, because it means Hungary can box well above her weight, as an ideological leader of 63 million people, rather than of 10 million. The geo-strategic importance for Hungary of Serbia, Bosnia, Macedonia etc joining (2025? ), would be to push Hungary deeper into the geographic centre of the EU, away from the dangerous periphery. But his project is threatened from several sides. If the British, at the last minute, were not to leave; if Merkel reasserts control of the CDU, and Seehofer’s star wanes in the CSU after the autumn Bavarian elections; if moderate voices in the EPP, in Germany and beyond, prevail; if Austrian Chancellor Sebastian Kurz places European unity ahead of anti-migrant schemes, and/or tempts Slovakia, the Czechs and Slovenes away from Orban, into his own camp, and thus weakens the V-4; if tensions flare between the new nationalist powers, for whatever reason. Even the continued rise of the AfD in Germany would be bad for Hungary (and Slovakia), by ending German goodwill towards eastern Europe, in terms of EU structural and cohesion funds. Despite so many clouds, Orban sails into this autumn under a blue sky.